Bobby Mao’s Chinese Kitchen + Mexican Cantina is now open at the Galleria at Sunset mall in Henderson. Restaurateurs Bobby and wife Tina come from Palm Desert, California. Located at the mall’s main entrance next to Red Robin, the more than 7,000-square-foot space offers a main dining area; bar and lounge with TVs, plush couches and booths; and a misted outdoor dog-friendly patio. The lunch and dinner menus feature Mexican and Chinese cuisines and include lettuce wraps, wonton tacos, Asian street fries, burritos, egg rolls and fried rice; and vegetarian dishes such as kung pao tofu, veggie fajitas and veggie chow fun. Bobby Mao’s Chinese Kitchen + Mexican Cantina, Galleria at Sunset, 1300 W. Sunset Rd., Henderson, NV 89014, 702-547-6649. The LINQ Hotel & Casino has debuted The BOOK, a 45,000-square-foot sports book enhanced with a full bar, restaurant, 24-tap self-serve beer wall, 87 TVs and numerous sports and bar games. Within the space is Sticky Chicken, an eatery set in an actual food truck. On the menu are 12 wing combinations ranging from savory (cacciatore & Parmesan, salt & pepper) to spicy (sticky Korean, Nashville hot); sandwiches, including The French Chicken (Dijon mayo, Black Forest ham, mornay sauce), The Gladiator (ricotta pesto, mozzarella, spicy Italian sausage) and Alligator Bait (chicken, Cajun rémoulade, fried green tomato and Cajun slaw); salads such as a classic Caesar, chopped Southern fried chicken and Asian wonton crunch; and dirty fries, like The Mess (smoked brisket chili, bacon, cheese sauce) and Steak & Eggs (Philly cheesesteak, peppers & onion, fried egg, cheese sauce). The BOOK is located in the LINQ Casino, just steps from The LINQ Promenade. Sticky Chicken, The LINQ Hotel & Casino, 3535 Las Vegas Blvd. S., Las Vegas, NV 89109, 702-370-7736. The top four floors of Park MGM are home to The NoMad Las Vegas, a 293-room hotel from Sydell Group in partnership with NYC chef Daniel Humm and restaurateur Will Guidara. The NoMad Bar is an all-day dining destination with a cocktail program by bar director Leo Robitschek. The NoMad Restaurant made its debut in November 2018, along with private dining spaces and meeting rooms. The NoMad Bar, The Nomad Las Vegas, 3770 Las Vegas Blvd. S., Las Vegas, NV 89109, 888-529-4828. Cipriani, the Italian institution which originally opened as Harry’s Bar in Venice, Italy, in 1931, will debut at the new Wynn Plaza in November. The Las Vegas expansion follows openings around the globe, including New York, Miami, Mexico City, Dubai and Riyadh, and will be the first Cipriani location on the West Coast. "We have been considering a Vegas project for a while, and this seems to be a perfect match as Wynn shares the same attention to detail, quality and service that we do," said Giuseppe Cipriani, third-generation member of the Cipriani family. The décor will feature a nautical feel with glossy walnut, chrome accents and terrazzo floors. The menu will include signature classics such as carpaccio alla Cipriani, baked tagliolini with ham and vanilla meringue; and the bar will serve the original Bellini, which was invented at Harry's Bar in Venice. Cipriani, 3131 Las Vegas Blvd. S., Las Vegas, NV 89109, 702-770-7000, 1-888-320-WYNN. Burger-centric Slater's 50/50 opened its first Nevada outpost this past summer and now it is bringing two additions to its menu inspired by the glitz and glamour of Las Vegas. The 24K Burger features a 24K gold-dusted brioche bun with three strips of 24K gold-dusted "billionaire's" bacon, a half-pound of Australian Wagyu beef, truffle cheese, baby arugula, bacon jam, roasted garlic aïoli and demi-glace. The Whale Burger contains three ounces of poached lobster, one pound of Australian Wagyu beef, three 24K gold-dusted "billionaire's" bacon strips, truffle cheese, baby arugula, bacon jam, roasted garlic aïoli and demi-glace on a 24K gold-dusted brioche bun and is served with a 375 milliliter bottle of Veuve Clicquot Yellow Label Brut Champagne. The 24K Burger is priced at $24 and The Whale Burger with the Veuve Clicquot Yellow Label pairing is $100. Both burgers come with a side of Slater's fries or sweet potato fries. Slater's 50/50, 467 E. Silverado Ranch Blvd., Ste. 100, Las Vegas, NV 89183, 702-766-5050. 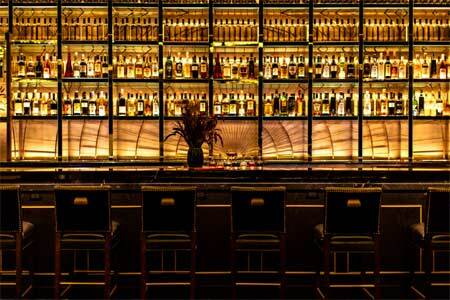 La Cave Wine & Food Hideaway at Wynn Las Vegas will undergo remodeling. It will be open for dinner only from Oct. 29 to Nov. 3, and then closed Nov. 4 through Dec. 30. The 3,000-square-foot wine cellar-inspired restaurant created by the Morton Group’s Jenna and Michael Morton opened in 2010. The slated upgrades will come with an estimated construction cost of $1.4 million, and while the projected cost would suggest extensive changes, no details have been released. La Cave Wine & Food Hideaway, Wynn Las Vegas, 3131 Las Vegas Blvd. S., Las Vegas, NV 89109, 702-770-7375. Breakfast specials are now being served at Robert Irvine’s Public House at the Tropicana on Saturdays and Sundays from 9:30 a.m.-2 p.m. The specials include chicken and waffles ($20) and a breakfast BLT stacked with maple pepper bacon, a sunny side up egg, tomato and hot syrup ($17). In addition, the restaurant has renovated its back room into a sports lounge, with drink specials offered during college and NFL football games including $3 Fireball shots, $5 well Bloody Marys, $5 Prosecco mimosas and beer specials on buckets and towers. Robert Irvine’s Public House, Tropicana Las Vegas, 3801 Las Vegas Blvd. S., Las Vegas, NV 89109, 702-739-2307. The Buffet at TI at Treasure Island has been renamed Corner Market Buffet after extensive upgrades. It’s located off the casino floor, adjacent to the Seafood Shack. The refreshed eatery’s offerings include a farmer’s market salad station; dishes featuring international flavors such as a protein bowl with tandoori salmon and forbidden rice, Peruvian chicken with cilantro sauce, Korean beef bulgogi, pork belly porchetta, Italian pizza and lobster ravioli; and a country bakery serving desserts, soufflés and gelato. Prices are weekday breakfast $23.45 (children 3-10 $12.45); lunch $27.45 (children 3-10 $16.45); dinner $33.45 (children 3-10 $19.45); weekend seafood dinner $35.45 (children 3-10 $19.45) and weekend brunch $30.45 (children 3-10 $16.45). A drinks option for unlimited wine, beer, sparkling wine, mimosas and cocktails is an additional $14.99. Hours of operation are 7 a.m. to 10 p.m. daily. Corner Market Buffet, Treasure Island, 3300 Las Vegas Blvd. S., Las Vegas, NV 89109, 702-894-7355. JW Marriott Las Vegas Resort & Spa has appointed Megan Shaver as executive chef of its Hawthorn Grill. Shaver grew up in upstate New York and earned a B.S. in Nutrition from Russell Sage College, after which she obtained a degree from The Culinary Institute of America, Hyde Park, New York. She returns to the resort after being at the JW Marriott Las Vegas from 2007-2014. After leaving in 2014, she was in Colorado (Art Hotel and Inverness Hotel & Conference Center), then went to the Virgin Islands where she was at Marriott’s Frenchman’s Reef from 2016-2017, and then was at the Atlanta Marriott Marquis. Shaver has also cooked on the East Coast and for four years at the Four Seasons Resort at Manele Bay in Hawaii. Hawthorn Grill, JW Marriott Las Vegas Resort & Spa, 221 N. Rampart Blvd., Las Vegas, NV 89145, 702-869-7777, 877-869-8777.